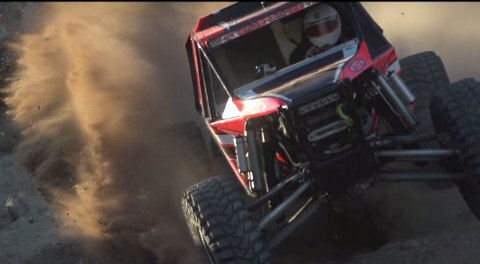 Off-road filmmaker Heavy Metal Concepts is on the motorsports radar after releasing the trailer for their documentary called The Kingdom. The film chronicles the eccentricities and suspense that permeates the annual racing/crawling event known as King of The Hammers. Held each February on Means dry lake bed near the Mojave Desert town of Johnson Valley, California since 2008, the race has grown to a spectator-friendly spectacle, replete with a small village that crops up, Burning man-style, around the race itself. Along with the 215-mile race, in which only a fraction of the entrants finish, wild parties and sub events swirl in a general dirt racing culture super collider. Founded in a bar by Jeff Knoll and Dave Cole in 2007, King of the Hammers has evolved into a destination for hard-core race fans as well as a sought-after resume point for pro racers. While the event venue is remote, limiting access to a large percentage of otherwise enthusiastic race goers, the documentary, set for official release in September of this year, promises to illustrate the experience as closely as possible without being there. Highlights from this year’s race give testament to the conditions and the excitement at the event. As described on the official site, the format of the race is “run what ya brung.” This means un-regulated four-wheel-drive racing and the most punishing rock crawling in North America. With an 80 percent attrition rate among competitors, teams compete at more than 100 mph and crawl like fiends to me crowned king at sundown. Given the hype and the popularity of the race, The Kingdom threatens to reach a par with the infamous 1970’s film, On Any Sunday in terms of film making as a means to popularize motorsports.